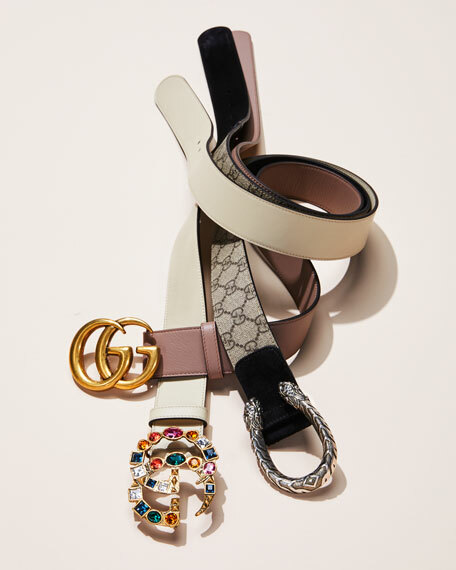 Gucci "Dionysus" belt in GG Supreme canvas. Double tiger head buckle. Antiqued silvertone hardware. Approx. 1.5"W. Suede trim. Made in Italy. Gucci elastic belt with red and green diamond pattern. Enameled tiger heads buckle with crystals—inspired by a vintage Hattie Carnegie jewelry design. Gold-toned hardware. Approx. 2"W. Made in Italy.